Your breath is a very important part of health. Incorrect breathing leads to many physiological symptoms such as chest tension, neck pain, shoulder pain, poor posture, fatigue, stress and anxiety. Interestingly, our breathing is one of the few automatic systems that we can also consciously control. So just as stress and anxiety can unconsciously cause us to breathe with short, tight chest movements, slowing our breath down consciously and breathing deeply can reduce our stress and anxiety. Consciously influencing our breath gives us a unique window into affecting our nervous systems, stress levels and our emotional response. Why do we learn to breathe incorrectly? • Emotional holding: we are often taught to hold things back emotionally and to do this we restrict our breath. • Chairs: sitting on a chair all day with slumped shoulders and a compressed belly restricts correct breathing. • Stress: when we are stressed we naturally tighten our jaw, neck, shoulders and diaphragm and we tend to hold our breath. Constant low-level stress gives rise to tight breathing. • Anxiety: constant worry and a churning, tight belly prevents our abdomen from naturally expanding and correct breathing to occur. Look at the diagram to the right. Your diaphragm is the horizontal sheet of muscle that divides your lung cavity and abdomen, roughly at the base of your sternum. When your diaphragm moves, it creates a pressure change in the lower cavity and makes it bulge. 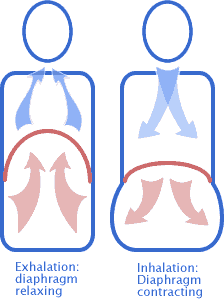 If you are breathing correctly, you are using primarily your diaphragm and hence your abdomen should move. There are many breathing exercises available and books dedicated to the subject. The main thing is to start to become aware of how you are breathing currently. If we aren’t conscious of something, we can’t change it. 1. Decide to start checking in on your breath throughout the day. 2. Place one hand on your chest and one hand on your belly. a. Which hand is rising more? b. Is the in-breath shorter than the out-breath? c. Is the in-breath more labored than the out-breath? d. How does the section between your hands feel – your diaphragm. Is there a tightness here? Belly or diaphragmatic breathing doesn’t need to be large and pronounced. A deeper breath is not a bigger breath. A deeper breath simply utilises the diaphragm more completely and draws air into the deeper areas of the lungs. We use the belly to focus, as this tends to elicit better diaphragm use. 1. Make sure your spine is upright, sitting or standing, so there is no pressure on your abdomen. 2. Imagine a blossom in your abdomen. 3. When you inhale, the petals of the blossom open. When you exhale, the petals of the blossom close. 3. What causes the petals to open is the gentle pressure change in your abdomen. If you force a larger breath, the petals will open too far and fall away. If you don’t engage the abdomen enough, the blossom will not open. 4. Sit with this for a few minutes. Notice the balance of breath that causes the movement of the blossom. 5. This may be hard at first, but after practicing for a little while, your breathing will settle.